Engineers often take inspiration from animal designs because they're more efficient than machines are. In the case of owl wings, nature has a major advantage over human engineering: owl wings are uncannily quiet. Now, researchers are considering outfitting wind turbines with an upscaled equivalent – if they can figure out how to do it. 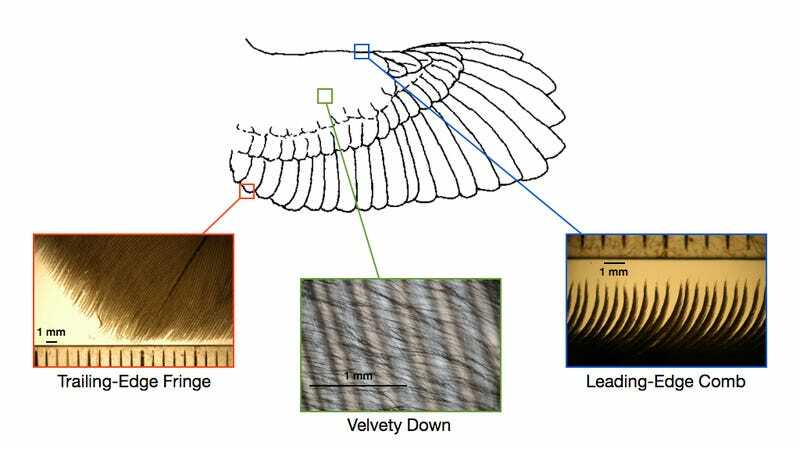 "Owls possess no fewer than three distinct physical attributes that are thought to contribute to their silent flight capability," said Justin Jaworski, whose Mechanical Engineering group at Lehigh University investigates the properties of owl stealth, and is presenting its research at this year's APS Fluid Dynamics meeting in Pittsburgh, PA. "A comb of stiff feathers along the leading edge of the wing; a flexible fringe a the trailing edge of the wing; and a soft, downy material distributed on the top of the wing." Together, these three unique wing features are thought to allow owls to fly almost silently. By creating and utilizing materials that mimic these features, engineers think they can design quieter tech. Jaworski's team, in particular, is interested in the development of technologies that can mimic the "forest-like" geometry of the fluffy down material on the top of an owl's wings. Such a surface is simultaneously compliant and rough, not unlike a soft carpet. "If the noise-reduction mechanism of the owl down can be established, there may be far-reaching implications to the design of novel sound-absorbing liners, the use of flexible roughness to affect trailing-edge noise and vibrations for aircraft and wind turbines, and the mitigation of underwater noise from naval vessels." Can you imagine it? Vast landscapes of windfarms, their whirling blades enveloped in a luscious coat of synthetic down? We can see it now.